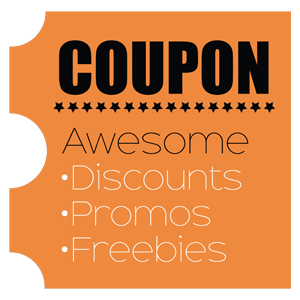 They give each customer special treatment, whether they are regular or new customers. All staffs are friendly and courteous. They all served us with big smiles. Their store has this cozy warm touch to it. One can simply enjoy and relax while enjoying a cup of hot coffee. 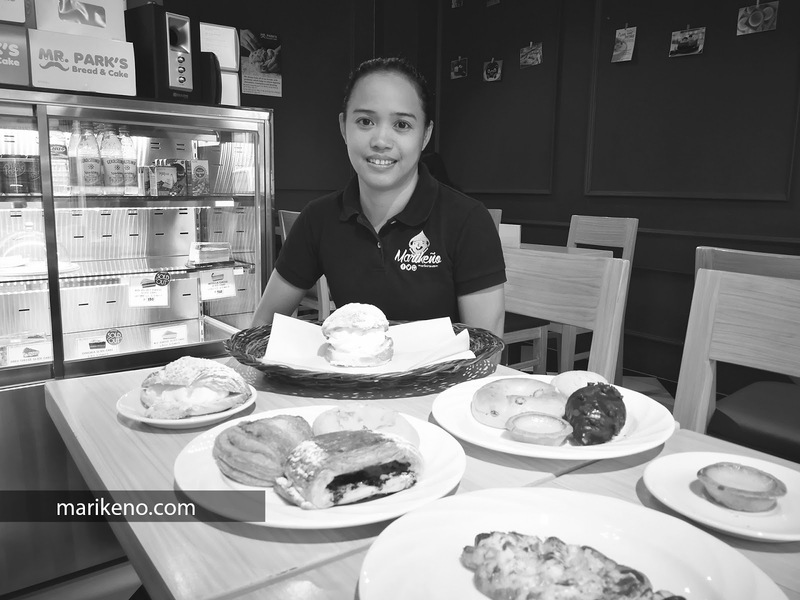 Their breads and cakes are healthy and have probiotics. No added preservative. Bread are fresh and delivered daily. Foods are inspired by Koreans who are known for being health buffs. Pane Pasta (Php190) is so rich and flavorful. 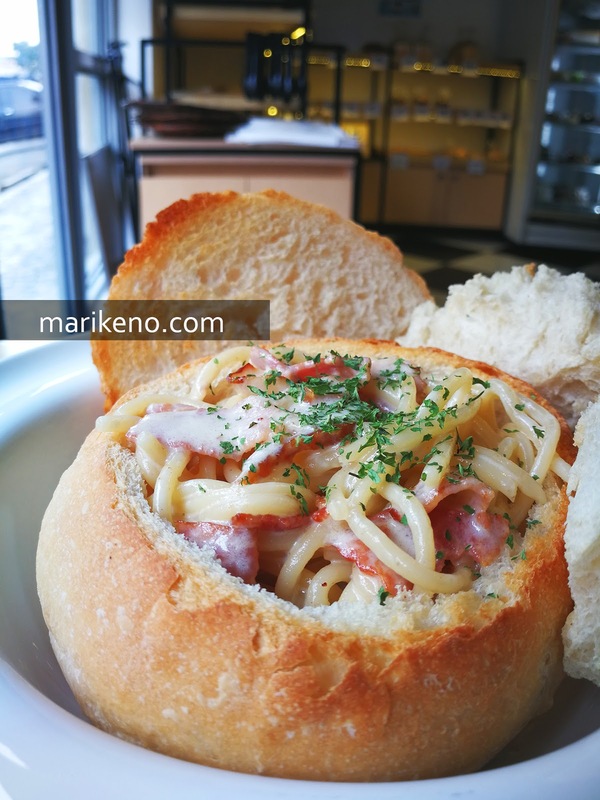 Thick pasta noodles placed inside a nicely toasted bread bowl with rich creamy white sauce and shredded bacon. Not oily. I really felt I was in heaven. Simply flavorful. No wonder this is one of their best sellers. Tteokbokki (Php190) 떡볶이 (pronounced as toboki or topoki) is a popular Korean snack that you often see in Korean dramas and programs. 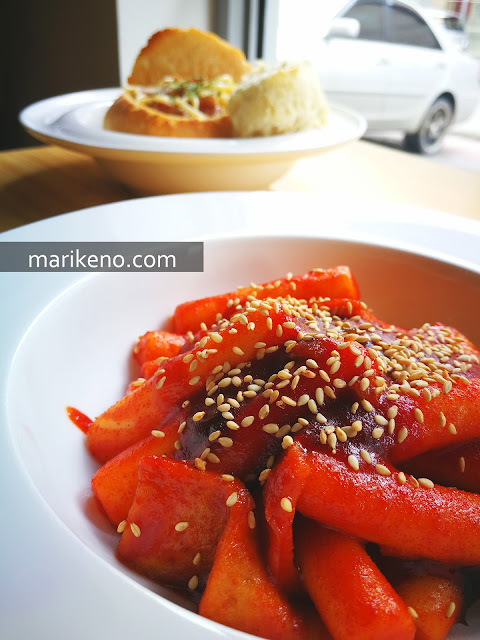 It is made from traditional Korean rice cake, Odeng (fish cake) and Gochujang or red chili paste. If you are wild and want to be suprised, you'd better try this wild dish. It is a perfect dish to be paired with their Pane Pasta. You will be transported to Korea. 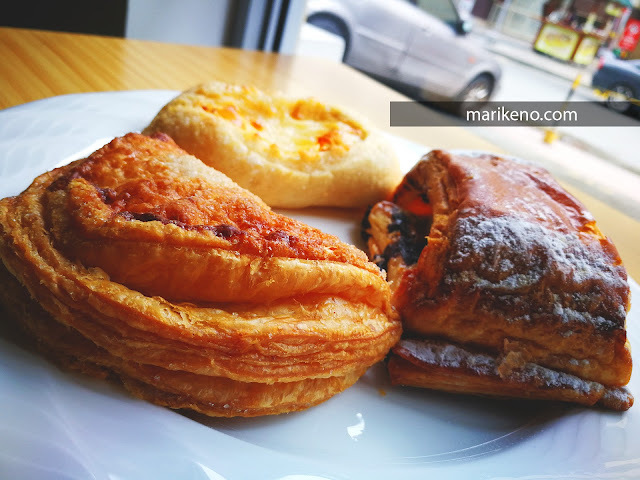 They have dozens of pastries to choose from: from baguette, croissants, tarts, cream puffs, etc. 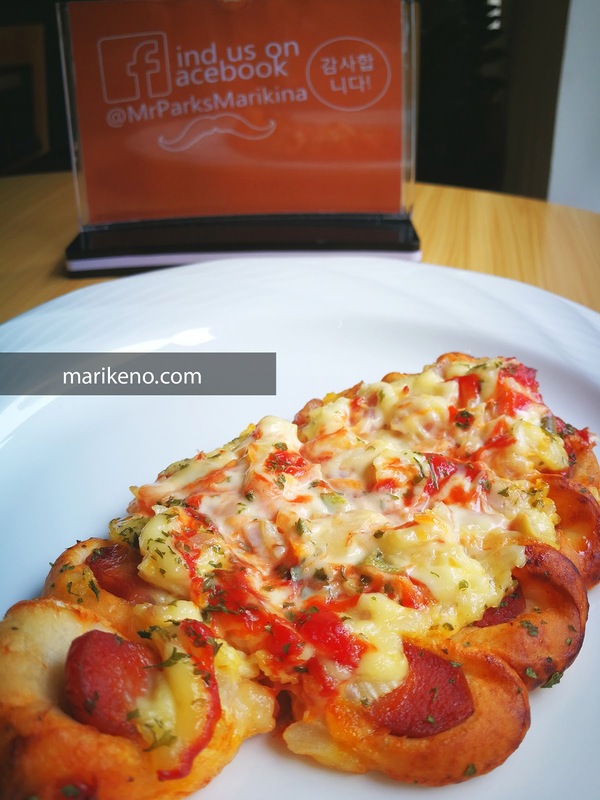 Our group's favorite is probably the Sausage Pizza Bread (photo above). 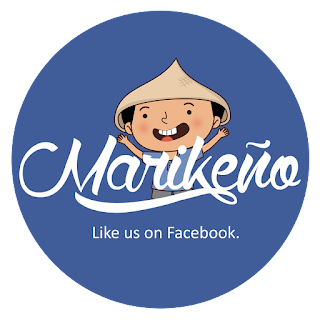 It is cheesy and has a distinct Korean taste that Marikeños will surely like as well. I also love their croissants. They have a nice texture and flaky. Just the way I want it. 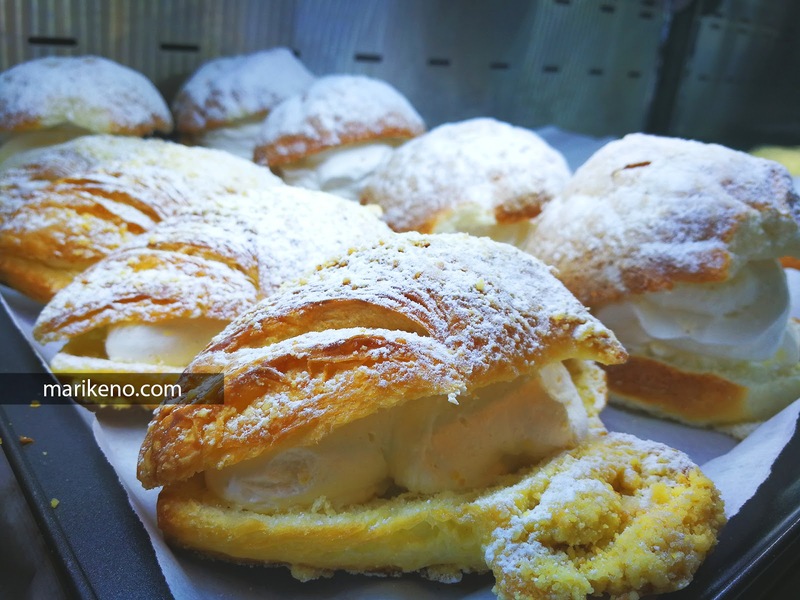 The Cream Cheese Puffs were also delicious. Pure divine. 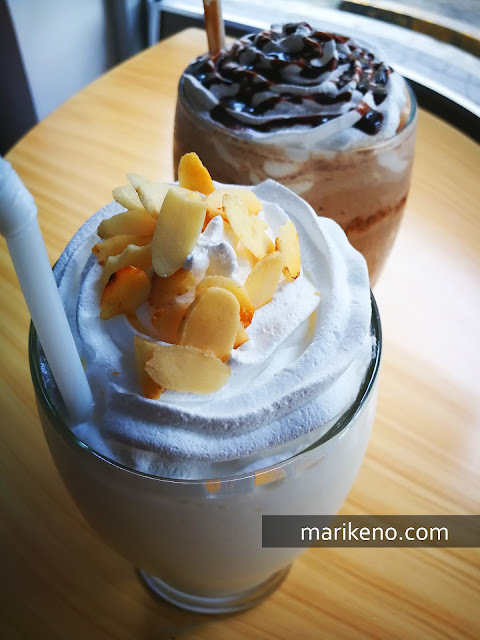 Have you eaten authentic Korean Bingsu in Marikina? 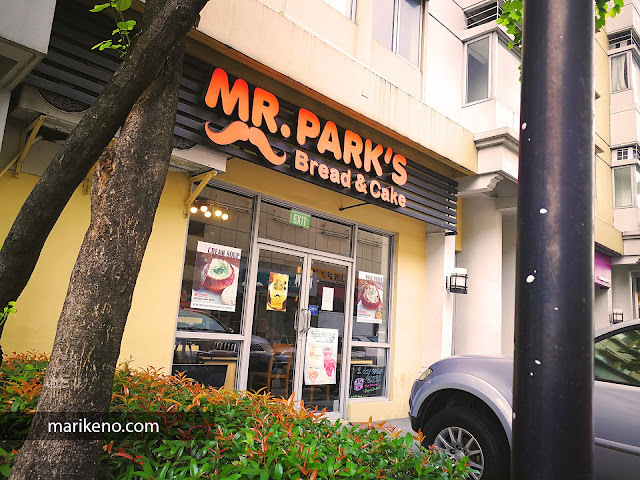 Yes, it is Bingsu Kingdom at Mr. Park's Bread and Cake. Bingsu is like Korean's version of our Halo Halo but with both traditional and modern ingredients. Their Green Tea Bingsu is probably their best in their menu so we've tried it. 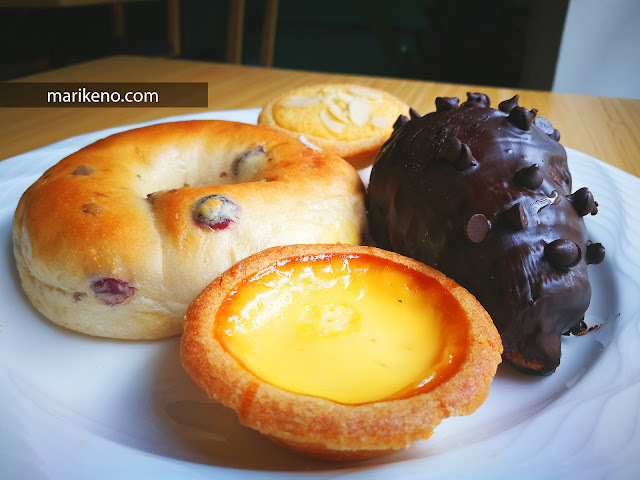 It is a flavorful, cool and visually appealing dessert. 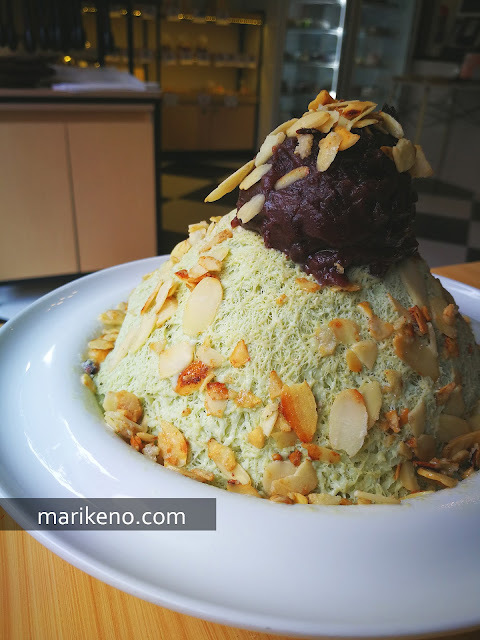 Made from perfectly shaved green tea ice, sweetened with condensed milk and topped with red beans and chopped almonds. 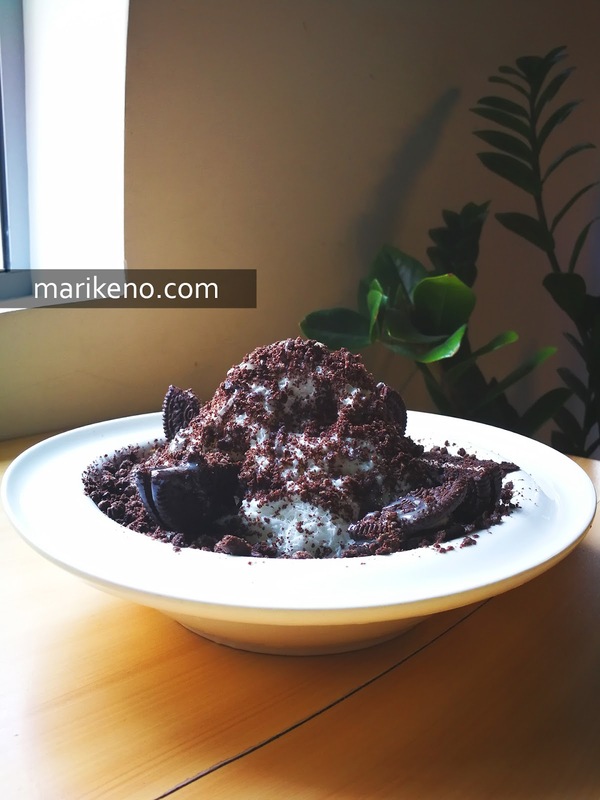 Oreo Bingsu is also good for those with sweet tooth. Made from powdered Oreo cookies, shaved ice and sweet milk. Mr. Park's also serves the best frappes in town. They have Vanilla Frappe and Javachip Frappe. They do not just look beautiful but they taste great as well. They may look very sweet but they are actually not. 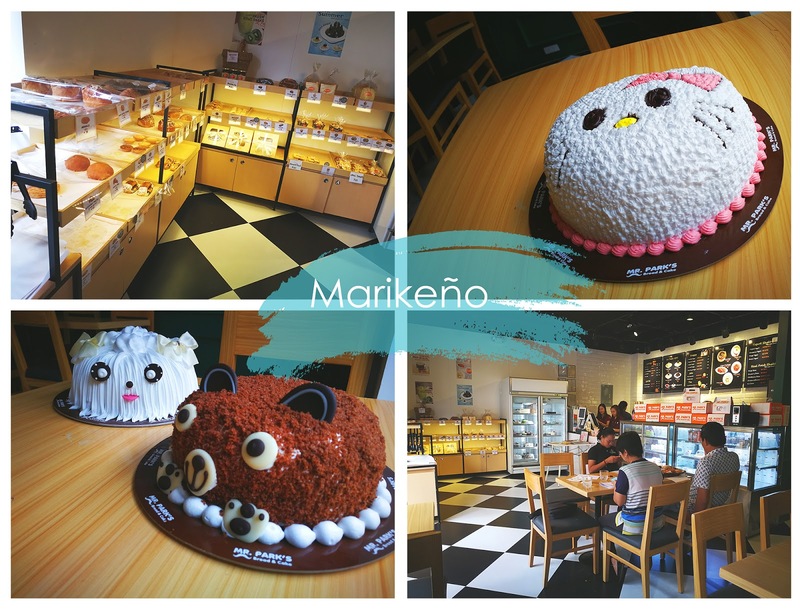 Koreans are not really fond of sweet and salty food. So their frappes taste just right. 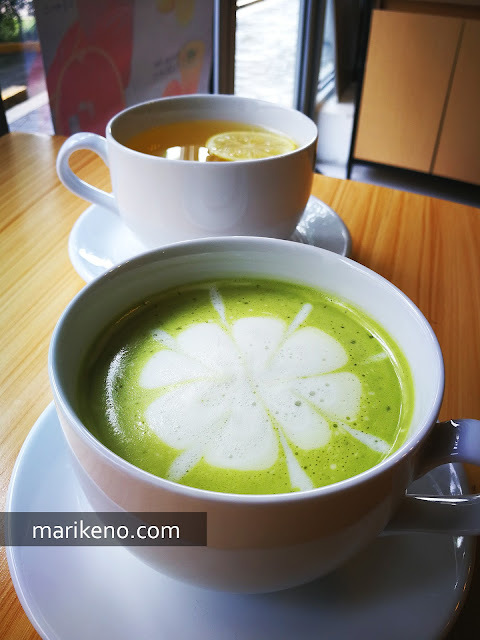 We've also tried their Hot Green Tea Latte which we highly recommend. It is your perfect cup on a rainy afternoon. Their Yujacha (Honey Citron) and Pink Lemonade are served fresh and really cold. Mr. Park's Bread and Cake Marikina is a perfectly good place to those who like to enjoy a slow afternoon while enjoying a good meal and some cool desserts. Their main competitors are Goldilocks for their cakes, Starbucks for their frappes and Pan de Manila for their bread. But at Mr. Park's they have all that. And the best thing about them is their excellent service. We will surely come back. Cons: 1. They do not have an oven for baking. 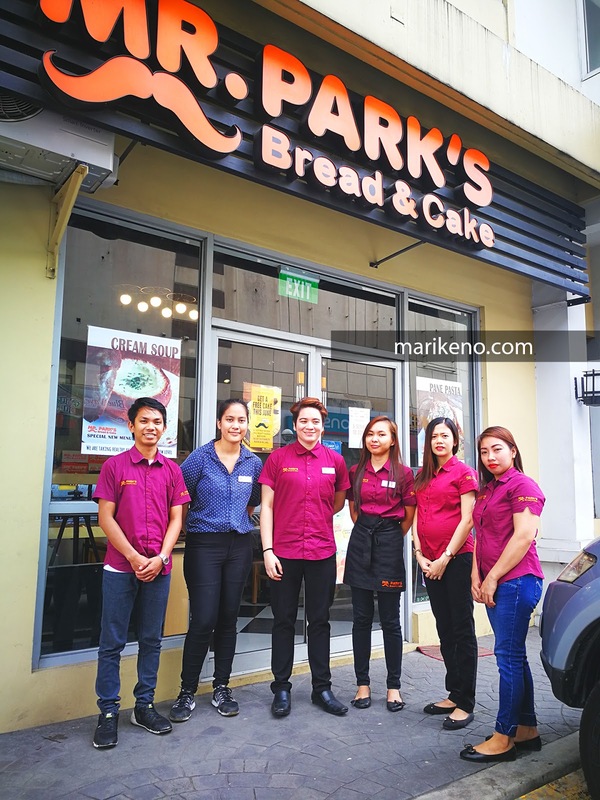 They bake their breads and cakes daily in Parañaque and delivery them to their branches. 2. They do no have a dedicated parking area. So you may have to park your vehicles in Marquinton Mall. Pros: 1. They give each customer special treatment, whether they are regular or new customers. 2. 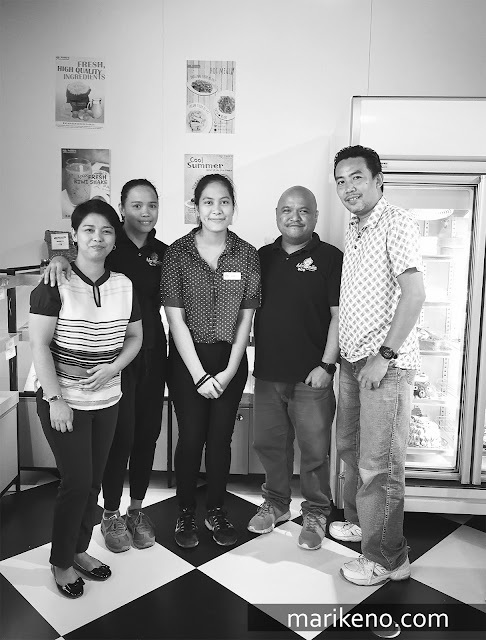 Their store has this homey atmosphere where one can enjoy a simple meal or chat with friends and family over a cup of hot coffee. 3. Their breads are healthy. No preservatives added. Rich in probiotics. Probiotics are good live bacteria that are good for the healthy and digestive system. 4. 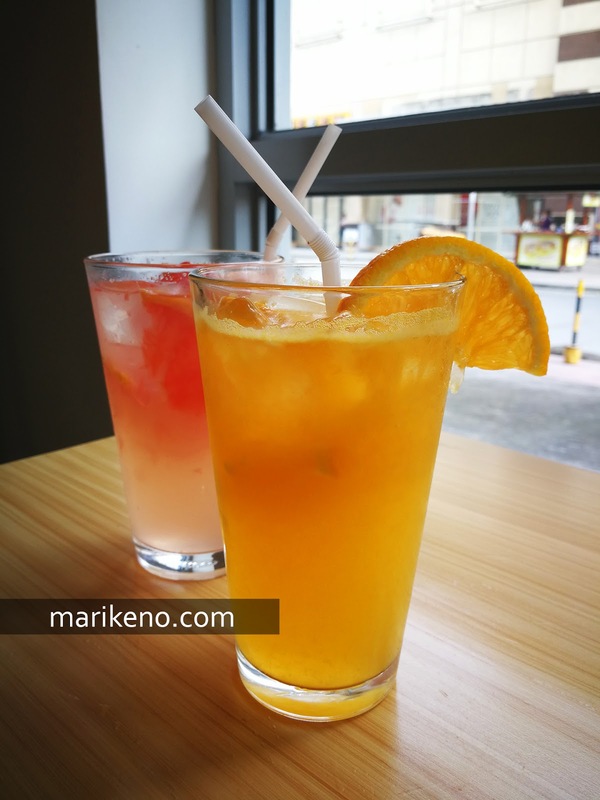 Most of their food and beverages are not too salty and not two sweet.